As part of the M&S Christmas launch last week, after the show they took us on a walking food tour in East London. Our first stop was in Spitalfields Market, at Taberna do Mercado. Quite possibly the fanciest little food stall in a market in existence. 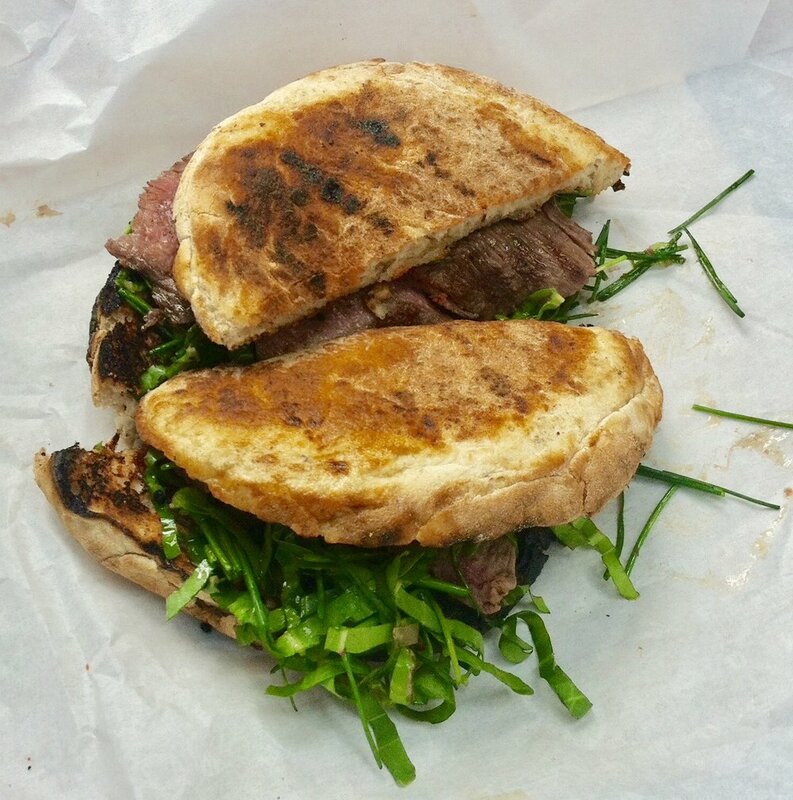 Michelin star Portuguese chef Nuno Mendes' serves up amazing steak sandwiches. I've never tasted anything like it. Absolutely beautiful. Next we visited one of the market's many food trucks, Crosstown Doughnuts. 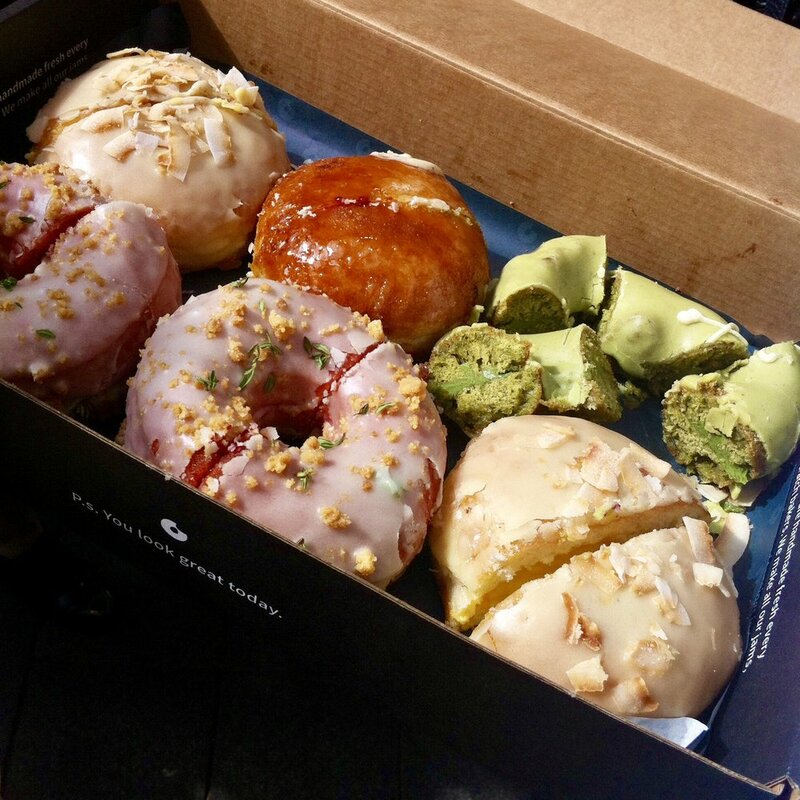 Their handmade doughnuts come in a selection of unusual flavours. Yuzu & passionfruit, matcha tea, peanut butter and jelly, and beetroot lemon-thyme, which I tried. They also have specific days when they serve completely vegan doughnuts. We passed another of the many food trucks, The Duck Truck, London's first and only full duck menu restaurant! Then it was onwards towards the very trendy Brick Lane. The storm clouds were gathering, and at one point the heavens opened on us and we had to take shelter under a railway bridge. Along Brick Lane was the next stop on the food tour, Dark Sugars. Just the scent of the shop was amazing. The aroma of cocoa and sugar was delicious. We tried their handmade products that came with a tiny pipette of fruit flavouring, which you squeezed into your chocolate before eating. 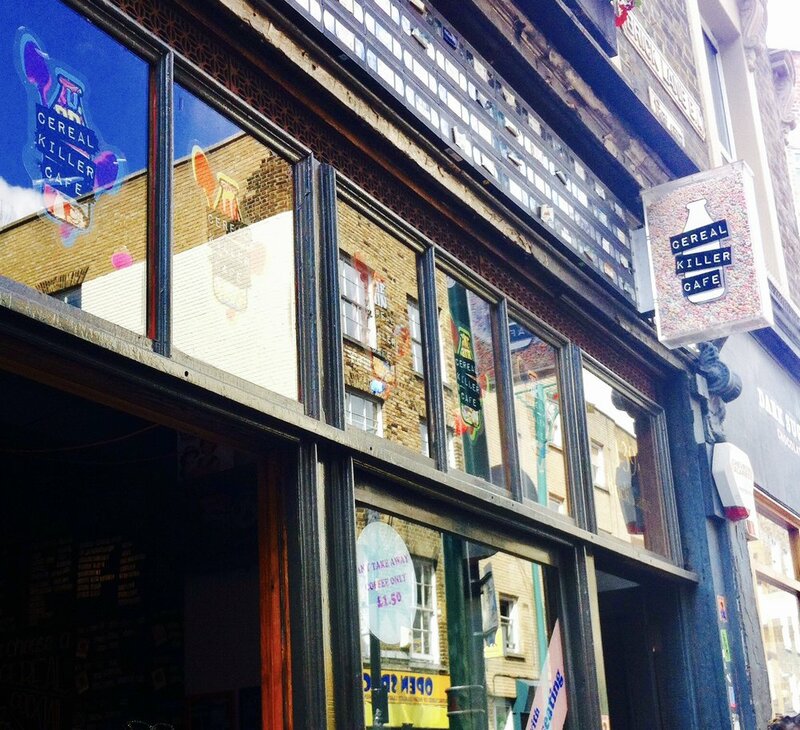 Also on Brick Lane is the Cereal Killer Cafe, the infamous breakfast only joint that made headlines when it opened. The owners are Northern Irish, and they've been very successful with their venture. There is even a Cereal Killer Cafe in Dubai. Our final stop was the 24 hour bagel takeaway Beigel Bake, which was exciting for me as I remember it being in The Apprentice!